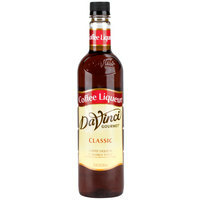 Choose from over 60 classic flavors, and discover the rich taste and quality consistency in each and every DaVinci Gourmet product, including this classic coffee liqueur flavoring syrup! DaVinci Gourmet flavoring syrups are made from pure cane sugar to complement your beverages without overpowering them with too much sweetness. They are specially formulated to resist curdling in milk and hold up well under heat, making them the perfect choice for espresso-based drinks, coffee, and lattes. It is also great for adding flavor to blended beverages, or cocktails like white russians mudslides at your bar. It can even be used for drizzling atop your cheesecakes and frozen yogurt for the perfect finishing touch, or as an ingredient in a wide array of baked goods! This DaVinci syrup has a very strong coffee flavor. You really don't need to add a lot. I have really liked it for making cocktails. The coffee liqueur flavoring syrup is very bold and has a wonderful coffee flavor to it. The syrup is great for adding to milkshakes and smoothies. This flavoring syrup is really popular in my coffee shop. I just tried it the other day to see for my self and it was delicious. I will definitely be ordering more soon. We use this syrup to make a White Russian in our coffee shop and it is one of our top sellers. Would highly recommend this one. A rich and bold flavored coffee liqueur syrup that is decadent and divine. A great way to make great tasting dessert sauces in a jiffy. When I saw that Davinci had a coffee flavored syrup I knew I had to try it. It takes your coffee to a whole new level. This is a delicious coffee flavoring syrup. I don't use it very often and am not sure why. It smells great and adds tons of flavor to your drinks. When I saw Davinci offered a Coffee Liqueur flavor, formerly known as their "Kahlua Syrup", I thought it'd be great for non-alcoholic white russians. Let me say, this stuff is spot on! Frappes with this flavor's out of this world, especially when paired with some kind of chocolate. This even works in things in addition to actual kahlua. You outdid yourselves Davinci! What an excellent syrup. The flavor is so strong and the scent is phenomenal. I don't know why I got coffee flavored syrup to add to my coffee but it's good! This coffee liqueur is delicious. We've been experimenting with flavor mixes and this is a hit. The syrup mixes well with the coffee and smells great. This syrup is the perfect addition to any coffee or espresso! Our customers love it, and so do we! The pump makes adding it to beverages quick and easy! I've been very impressed with DaVinci Coffee Liqueur flavoring syrup. I have a lot of customers ask for me to put it in they're black coffee! This one has a good coffee flavor. Some out there taste like burnt coffee but this one does not. It is great to add to hot cocoa to make a mocha. Tiramisu is knocking at my door with this coffee liqueur. This is a great quality product. I don't think you can find a better quality anywhere else. Great taste when used to soak ladyfingers for the infamous tiramisu. DaVinci's gourmet coffee liqueur flavoring is so delicious and adds just the right amount of flavor to our coffee and espresso drinks. It's a great buy! Pair this with white chocolate sauce for the perfect white russian flavor! I like to add it to my personal coffee every once in a while just for that added sweetness! Great in coffee and so much more. You can use to make shakes, in baking, and on ice cream. Taste just like the real thing. Perfect if you love the taste of Coffee Liqueur but can't have the alcohol. I absolutely love the taste of DaVinci's Coffee Liqueur syrup. It really makes a great addition to your desserts, coffee & espressos. Makes a bland cup of coffee more exciting! We love DaVinci's Coffee Liqueur. We use it with vanilla and make a latte It seems kind of weird to have a coffee flavored syrup in coffee but it is very popular. This syrup is so delicious! I love lattes and my husband and I add the coffee liqueur to our morning lattes. It is one of my favorites and I will be reordering! The perfect addition to coffee or anything you might want to add it to. It has the right flavor to spice up that cup of java. This is a very tasty coffee syrup. You can use it in whipping cream that you use to top your drinks too. Also very good in cocoa. I love all the DaVinci syrups. They are FAR superior to other brands. The flavors are much deeper, more complex and less artificial tasting. Some are better than others though... the English Toffee is my favorite and I like that as a base for everything else. I love the Dolce D'Leche and the Coffee Liqueur. The Carmel is good as is the vanilla and Coconut. The banana is ok, though it's got that really fake banana taste. My kids love that taste though, so go figure. Same with the peanut butter and the chocolate... they are good, but taste nothing like the real thing. Creme d'Menthe is an interesting twist with the Chocolate. I placed an order for the Strawberry, Irish Cream and Coffee Liqueur syrups and they arrived pretty quickly. First one was the strawberry syrup that I tried and was very pleased with it, it also was the one to run-out the quickest. Then I used the Irish Cream and Coffee Liqueur with coffee. I am using Coffee Liqueur only once in a while since it is the only syrup that I have left. Will order more syrups next time. I also use the syrups with seltzer water and ice cream.